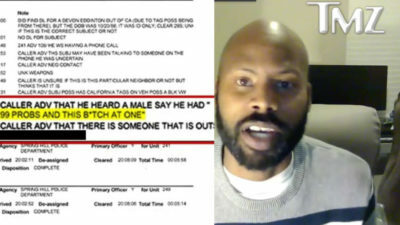 I know what you’re thinking, there’s no way a nosy white person would call the cops on a black man because they were eavesdropping and heard him reciting lyrics to a song. Well, you would be wrong. According to TMZ, Davon Eddington was having a beer in his Spring Hill, Tenn., backyard, talking with his brother about the Los Angeles Lakers’ newest superstar LeBron James, insisting that he would not become a Lakers fan overnight. Eddington says he walked around to the front of the house and discovered police with their guns drawn. The police eventually told him that his neighbor had listened in on his conversation and called the authorities, alleging that Eddington was beating his fiancee, who was upstairs taking a bath. Eddington says that the cops told him it was a misunderstanding, but he says that this isn’t the first run-in he’s had with the neighbor, even though he’s never met the man personally. “Maybe he doesn’t want me in the neighborhood,” Eddington theorized. I think you get where I’m going here… It’s exhausting being Black in America.